Future Classics was tasked with creating a kitchen deemed to be bold. A kitchen which would take centre stage as the focal point within the ultra-modern home in which it is placed. The concrete and glass home was designed by master architect, Enrico Daffonchio. The home was planned as if to be perched on top of a hill in Hollywood, Los Angeles. Upon entering the home, with its bold mix of raw and sleek materials, one is met by a capacious seven meter double volume living area. You can sense the home owner’s astute nature by the homes’ bold structure and that this home would require a sophisticated kitchen. Future Classics, leaders in designing and manufacturing state-of-the-art kitchens, were well equipped to design and build this bespoke kitchen for this daring home. At first glance the kitchen reads as an architectural feature rather than a kitchen and blends in harmoniously with the rest of the home. The challenge: Fitting the 7.1m high units which are 5mm in density, and made from natural walnut cladding, into a 52m2 space, while incorporating the integrated technology. 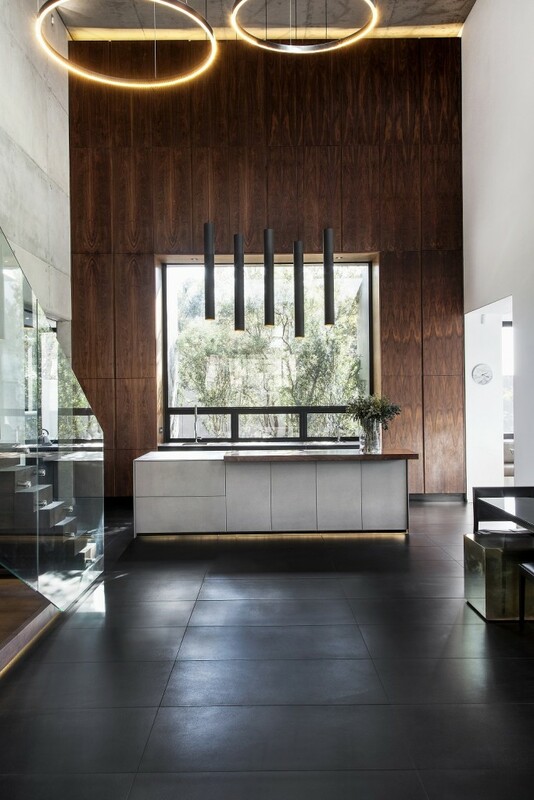 Taking a cue from the existing elements around the home this kitchen cleverly creates a striking balance between textures while adding contrast and interest to the kitchen surfaces. With some textures being apparent when seen and others when felt – stimulating visual interest. The kitchen has been fitted out in natural walnut and charcoal duco. The breakfast top is made from an immense piece of solid wood which doubles up as a server and cantilevers over the island top, which is made from Neolith an eco-friendly natural material that is sustainable and energy efficient.